After a marketing campaign that had mixed emotions among the action figure community, HasCon 2017 has come and gone. Did it live up to the hype? Were all the haters to be proved correct? Was attendance low or high? All valid questions that we hope to explore and discuss on a real level. I guess we should start with how I attended the show. I purchased a V.I.P. Magic:The Gathering pass (Yes.. I play and collect MTG). As part of the ToyArk network I was both going to report on the show itself and the Hasbro Brand product reveals that would be going on for the weekend and try to get my geek on for a few MTG events. Hascon as a Toy Collectors event: As a fandom (G.I. Joe and Action Figures of all brands) we have been very lucky to have a vast selection of solid Toy Collector focused events all over the USA. As a result we have a set expectations as to what that looks like in the action figure community. I think HasCon is a perfect example of the expectations vs reality of how it can still be a huge success even tho it does not fit into the mold we are all used to seeing. The dealer room was super small and mostly full of Magic: The Gathering merch. Did that matter to me? Not at all. HasCon was a show similar to SDCC in the big marketing event atmosphere and brand immersion. Big interactive displays with enough freshness (reveals) to make it worthy of a premiere event. This is what Hasbro was trying to tell us from the start, this is a Family Event, bring your kids, not bring yourself and drag your family along disguised as a vacation. To that effect Hasbro – Hascon gets an A for a Family Fun event that if Hasbro decides to do again I will be bringing my Son along for the ride. All the children I saw were having the time of their life. Hasbro had set up nicely spaced out sections for all the major Hasbro Brands with heavy focus on interaction and the staff to back it up even under the crowded Saturday conditions. When I think about all the next generation of collectors “talk” that goes on, I can think of no better way to introduce kids to Hasbro Brands then what HasCon provided. They knocked it out of the park on that angle. Just FYI – As a V.I.P. on Friday HasCon looked to be lightly attended. While I enjoyed short lines, no waiting to try new things and look at display cases, I was a little worried at the numbers on attendance early on. Fast forward to Saturday and it was a mad house, very populated but still room to enjoy your space. Overall attendance looked to me like a big success. Especially on the kids side. V.I.P. Gift Bags – The gift bags were decent and full of cool goodies, but that was just the start of the free stuff Hasbro was giving away. The V.I.P. lounges were full of free swag from playmats to books and actually an awesome selection of food. Fresh fruit and free soda, juice and bottled water all weekend. I also saw a ton of Hasbro guests and brand managers pop into the lounges and hang out for Q&A and product reveals. Exclusives – All of the HasCon exclusives for the show were solid and second to only SDCC’s normal dominance. Good thing most of those were there for sale, and so was a nice selection of discounted current product at the Hasbro Toy Shop. On that note I would love to have seen that part of the show grow. Why not have a Star Wars shop? Why Not have a Transformers shop? There was clothing on display that I wish I could have purchased. Same goes for Tonka. They had a big display and I could not buy one for my son (good thing I won one). More of what Hasbro sells and what the licensed merchandise has to offer for on-hand purchase. Magic:The Gathering – I think I have a very unique perspective on this side of the event. Since I come from a Action Figure collector background, so you would think my primary reason for going would be G.I.Joe, but for me having attended so many JoeCon’s and endless SDCC attendance (having seen most of what was shown) it was actually for the awesome focus on the mega brand Magic: The Gathering and it’s 25th Anniversary celebration. It was no shock to me that my group of collector friends had no clue how big this brand really is and why so much space and attention it was getting. This is just one of the ways that the collector base who attended Hascon had a little culture shock. That’s right Toy Collectors! Magic:The Gathering is the second most profitable Brand that Hasbro owns. Anyway I went on a V.I.P Magic: The Gathering pass and I can tell you that part of the show was worthy of the cost of the brand experience. The blind Iconic Masters drafts, MTG 25th Anniversary Party and MTG 25th Anniversary Panel were all highlights of the show. Hats off to the crew at WOTC and a special shout to Mark Rosewater who hung out for several hours in at the V.I.P. Lounge answering questions, and generally bullshitting with fans on a real level! It’s easy to see why this brand continues to out preform. The G.I. Joe Display and presence at HasCon – I’m not sure how this happened but I think some of the fan base expected a new G.I. Joe line to materialize at HasCon. While I would have loved for that to have occurred, Hasbro has always maintained they will launch the next G.I. Joe line when they have a new Movie to support the brand. On that note as a G.I. Joe “Super Fan” as Hasbro called it, HasCon offered very little to me as a Joe fan that I have not seen several times or met the people and guests that HasCon provided. While I understand the focus on the past to an extent, it’s old hat. The other brands had tons of hands on interaction of new product, so I’m looking forward to the future. We have celebrated the past enough, it’s time for new blood. Now after having said all of that, it’s only fair to point out… how many of the other people in attendance, other then the usual core JoeCon crew, have seen G.I. Joe and experienced the Brand like we have over the last 20 years? Almost none, so for them it was all new and a fresh and awesome to see that display at HasCon, and to hear and see the teams of people who worked on the G.I. Joe brand for so long, all in one place, that took me 15+ years of cons and shows to experience. See what I’m trying say? Hopefully…..
For me the show was also a highlight of years of personal relationships with people from all over the World. All at one spot hanging out having a good time, both enjoying HasCon and what Hasbro had to offer, and all the after hours fun. Looking forward to next year and a fine tuned show. Thanks for the great time Hasbro! I, too, was a little surprised that a few members thought Hasbro was going to reveal new product for GI Joe when for weeks we've been reporting the exact opposite, lol. 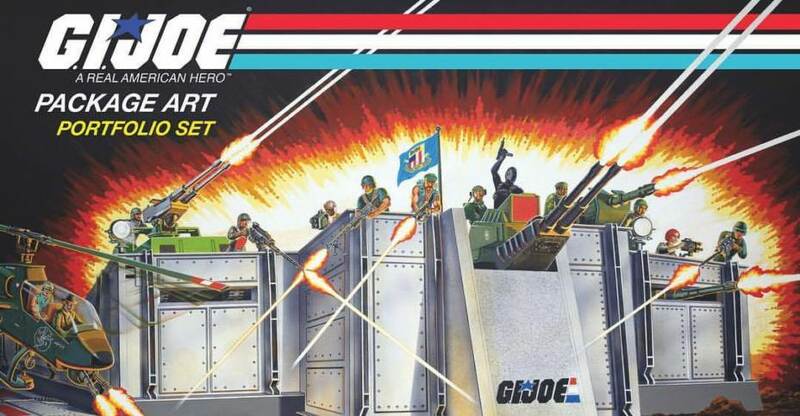 Hmmm... with MTG being the huge success it apparently is for Hasbro, I wonder how a new GI Joe-themed collectible card game would fare, one with mechanics designed to appeal to MTG/CCG players and not necessarily preexisting Joe fans (who may or may not be into CCGs). I didn't expect anything new. Honestly that's a big part in why I didn't bother to attend. Not that I'm a big Con guy, but considering Hasbro really didn't have much to offer for Joe or Transformers, there really just wasn't anything *I* wanted to see. I stress *I* because I had no doubt that Hasbro would at least put on a good show with a number of properties represented...BUT considering there was essentially a token presence for Joe and TF and as near as I can tell no presence for Jem, or MASK, or Visionaries...or hell even Micronauts or Rom there was just no reason for me to want to go. I'm glad people enjoyed it, but I think I will (if I go at all) wait til there seems a reason for me to go. I didn't expect anything, but I was certainly hoping there would be.... something. A word, a plan, an outline on a paper napkin. I'm sorry I don't accept that they have to wait for a movie. That's bull. When Hasbro reinvented the 3 3/4" figure, they didn't wait for someone to promote it. They went to the biggest comic company of their time and they made it happen. First a comic, then beautifully rendered comic cartoon commercials, and ultimately one of the most popular cartoon series of the 80's. That wasn't an accident or happenstance. They had an idea, they developed the brand and they marketed it like crazy. I didn't attend but from what I heard it just seems like a big missed opportunity for Hasbro to reintroduce GI Joe or at least promote their new future venture of the shared universe. I mean they had a Revolution SDCC exclusive, but nothing related here? I think they could have had some kind of Joe-themed interactive game or experience for the general masses instead of relegating it to a $600 exclusive dinner. Oh well, maybe next year, right? Revolution is a comic only thing right now, so it makes sense it would be at a comic convention. I am glad this event was geared for kids, after all that is what makes childhood so great. As stated multiple times on this site, if kids aren't interested it won't do well at retail. Having said this, I honestly do not see how Joe could ever come back in this day and age of video games and tech centric youth. For anything to have true staying power and appeal it must hold the interest of kids. Back in the day of the early 80s the cartoon was new, fresh, and appealing. Sadly, this is not likely today. I don't think reinventing or rebooting Joe will help either; shelf life for these types of campaigns never seem to have staying power. It saddens me to say it because Joe is the best, but it appeals to an older generation. I hear people say all the time that their child loves the Joe cartoon and thus it must still resonate with kids. I would say those children are the exception, not the rule, influenced by their patents'love for a nostalgic show. I am glad this event was geared for kids, after all that is what makes childhood so great. As stated multiple times on this site, if kids aren't interested it won't do well at retail. Having said this, I honestly do not see how Joe could ever come back in this day and age of video games and tech centric youth.. In my humble opinion, if there were a fantastic GI Joe video game, we might be able to generate some buzz.